Manduca rustica - largest of the genus, and the obvious exception to the rule. M. rustica does not eat nightshades. SIZE: Adult--2 1/2", larva--3" to 4"
IDENTIFICATION: Adults are narrow-winged gray moths with rows of orange dots along furry abdomens. They drink nectar from flowers at dusk. Torpedo-shaped body. Larvae are green caterpillars with a black horn on the tail (tobacco hornworm has a red tail) and white diagonal marks on the side. Eggs are round and green. BIOLOGY AND LIFECYCLE: Caterpillars are seen more often than the adult moths. They pupate in cells in the soil. Large brown pupae overwinter in soil and emerge in June and July. The pupa has a tongue case resembling a jug handle. Females lay eggs singly under leaves. HABITAT: Tomatoes, potatoes, eggplant, green peppers, tobacco plants, and various weeds. 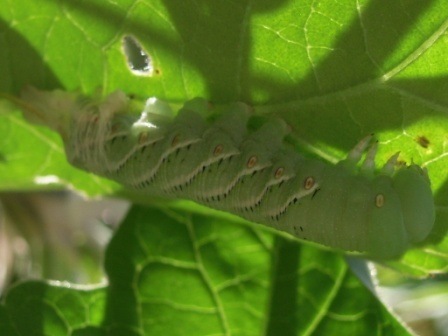 FEEDING HABITS: Caterpillars feed mostly at night on foliage of nightshade plants like tobacco and tomato. Moths sip nectar from flowers. ECONOMIC IMPORTANCE: Can defoliate plants overnight. The adult with its long proboscis is necessary to pollinate deep-throated flowers and nightbloomers. NATURAL CONTROL: Birds, parasitic wasps, and braconid wasps attack the worms. Trichogramma wasps attack the eggs. Skunks. ORGANIC CONTROL: Hand-pick caterpillars. Spray Bacillus thuringiensis products as a last resort only. Release lady beetles and lacewings to attack eggs. INSIGHT: There are some 100 species of this moth in this country. They include the tomato hornworm, tobacco hornworm, hawk moth, and hummingbird moth. A single worm can eat most of a tomato plant before pupating. Because of their large size and appetites, the adult females usually deposit only one egg per plant. The larvae of most species have a horn at the end of their body, which gives it some protection--at least from humans who are scared of being stung. However, the horn and the mouth of these caterpillars are harmless. In some species the developing moth's tongue or proboscis is so long that the pupa has a sheath curving out from the head and away from the body and then back, resembling a jug or pitcher handle. They are easy to hand-pick but are often missed because they blend so well with the plant. Hungry skunks that nightly patrol fields love to eat tomato hornworm. The adult moth could be considered beneficial. With that long proboscis, they are necessary pollenators, able to feed on the nectar of deep-throated flowers and--since they are active at night--of flowers that open only at night. 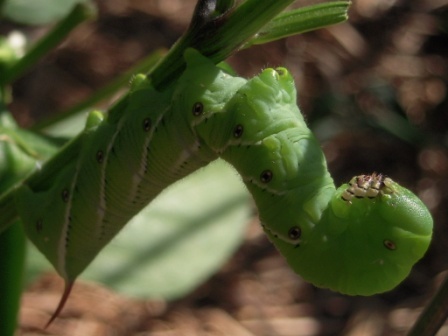 "One thing that really needs attention, is the need to dispel the utter myth and wives tale that "a single hornworm can defoliate or strip an entire plant." As a breeder and keeper of these beautiful and often highly beneficial caterpillars and their moths, I can assure you, one single hornworm takes a total of 2.5 to 3 weeks to fully develop, from hatch. They really don't get big at all, for their first 7-10 days, but once they reach 3/4" length, their growth is exponential before slowing down, and eventually not eating, prior to pupation. Pupal gestation runs 3-4 weeks. 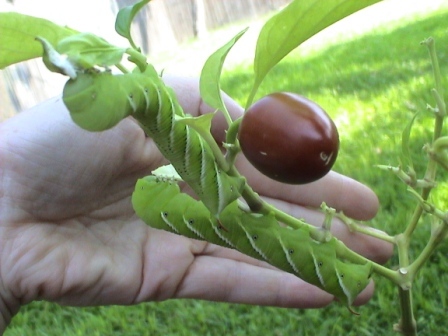 Truth is, a single caterpillar can eat pretty much most of a small, potted tomato start, about 10" to 12" tall with at least 4 small branches. However, nature has set hornworm season late enough, that tomatoes, peppers and such, have had time enough for growth and vigor, lest the moths send their offspring to doom by starvation."